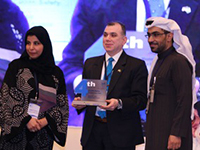 Dr. Khalid Kamal traveled to Saudi Arabia in late November to deliver the keynote presentation at the 4th Scientific Meeting for Medication Safety at King Saud University in Riyadh, Saudi Arabia. The title of the presentation was The Growing Burden and Management of Prescription Medications: Opportunities and Challenges. Dr. Kamal also led the three-hour workshop Decision Modeling and Economic Assessment of New Prescription Drugs at the meeting.